The Canyon™ deep-engraving system is designed to support both circumferential and flat laser engraving requirements or with the rotary indexer removed, larger size flat deep-engraving applications. With the use of a linear track, the rotary indexer optimally positions each cylindrical object directly underneath the fixed-position laser adapting to changes in part length. When the rotary indexer is positioned to the side of the oversized processing chamber, the Canyon™ supports flat laser engraving applications with marking sizes out to 12” x 12”. 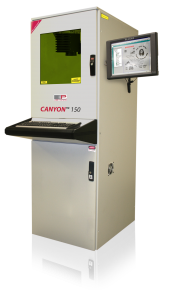 The Canyon™ unit is configured with a 50W Fiber laser or 100W CO² SLAB laser with a vacuum table and blowers to ensure the highest quality of workmanship and processing speed for applications with depth requirements > 0.003”. The Canyon™ PLUS deep-engraving machine is designed to support large volume laser engraving applications and oversized objects. The Canyon™ PLUS system incorporates Direct Drive Motion System (DDMS) technology that levitates the 50W Fiber laser across a 42” x 42” working surface. The batch lot size is based on the number of units that can be placed inside the processing chamber. Blowers are positioned around the Galvo scan head to rapidly remove debris eliminating re-melting creating high-quality steep edges while reducing the processing time, the trademark of the Canyon™ family.